My heart was full as I looked around my living room. Mom and Dad’s four grown children were meeting for the first time in their adult lives without the parents being present. Planning a 50th anniversary party was a big job and required some skills in which we were not practiced: communication and cooperation. 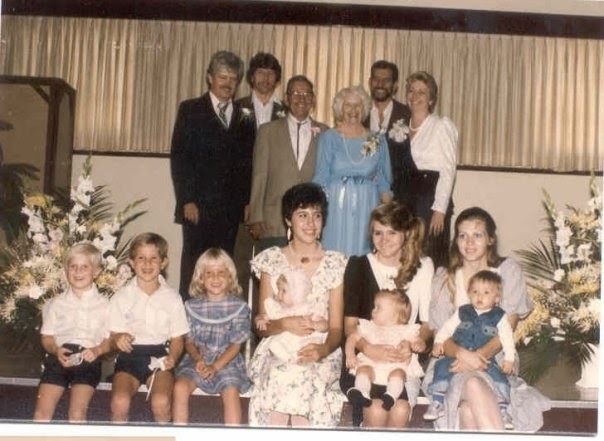 This was to be a labor of love, and we each knew it was a time for us to work together on a common purpose.Painfully aware of the fences that had been built between some of us, old hurts and resentments were set aside in favor of creating a wonderful celebration for Mom and Dad’s special day. I thought I could hear the creaking of a gate opening for us that day. Hope for us as a unified family was what filled my heart that day. Vic and Laura were married on September 4, 1935, forever making Labor Day week-end their time to celebrate another anniversary. When you have four children, that usually consists of dining out at a nice but not too expensive restaurant. Dad would order steak, Mom had her filet of sole and their children argued that hamburgers were special. As the family grew up, dinner dates for two were more common, with a stage play to follow if it was a milestone year. The plan in 1985 was a big party with extended family and friends; a renewal of their vows was also in the mix. Putting my project planning skills to good use, we came up with a list of tasks, schedules and estimated costs. Brother Vic, forever dubbed Vic, Jr. by the family, had connections with a caterer. Ed, their second born, lived near the L.A. flower market and would order all the floral arrangements. As the only daughter, I agreed to handle the invitations and solicit letters of special memories from the guests ahead of time for a memory album. Steve, the baby of the family, would handle balloons and decorations. Yes, we were a team on that planning day; not even a whisper of disagreement or sarcasm was heard. September 4, 1985 dawned in typical fashion for a So-Cal Labor Day week-end: clear skies and hot sunshine. Siblings and spouses were at the church early to clean, decorate and set up in the church hall. All our planning had paid off and everything was running smoothly and on schedule. As guests began arriving, the caterer put the final touches on a large ice sculpture: a basket with woven design, tall looped handle and real fruit cascading from the top. It was the star of the buffet table. This was no backyard barbecue, folks. We were showing a little class! The memory of that celebration is captured by a photo of Mom and Dad with their four children, seven grandchildren and two great-grandchildren. It was a happy moment in a golden day.